Should you empty drawers before moving a dresser? Customers often ask us this question. The answer is often no. We can move your dresser loaded. A full dresser is heavy. But, if you don’t unload its contents, you save time. You’ll also open up space in the moving van. However, like many things in life, the devil is in the details. It’s safer to unpack a dresser before moving it in some situations. Before moving a dresser, we’ll evaluate the situation. 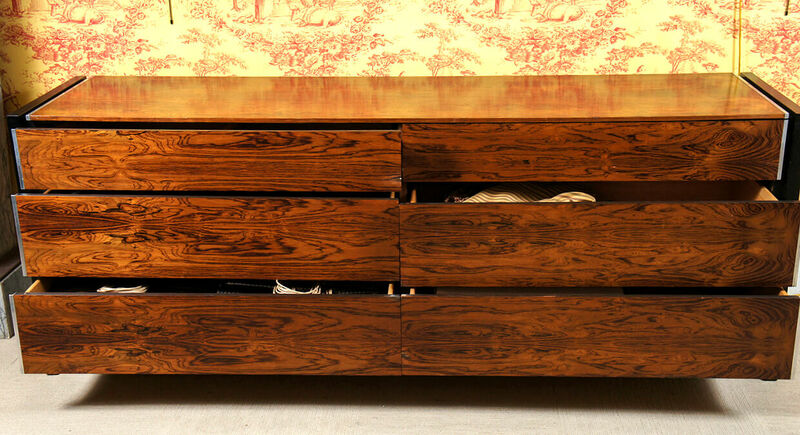 We look at the type of dresser and what’s in the drawers. If it’s not safe to move the chest loaded, we’ll empty the drawers and pack the items in separate boxes. If you’re doing the packing, here’s how to decide whether or not to empty drawers before moving a dresser. You don’t need to empty the draws of a well-built dresser in good shape. What makes a dresser strong? The drawers and frame should be solid. The joints and corners of the piece should be stable. A sturdy dresser is often heavy and made of solid wood. If you lift the dresser, and it feels flimsy, empty the drawers before moving it. If the dresser is fragile or old, full drawers will stress it. The wood might crack or the piece break apart when it’s in motion. If the dresser is solid, our movers secure the drawers before picking it up. We wrap the dresser in padding. Some people use a type of plastic wrap to keep the drawers from moving. Always empty the drawers of a ready-to-assemble chest. Take apart this type of furniture before packing and moving. If a dresser has an attached mirror, always remove the mirror and pack it separately. If you’re moving yourself, be sure you have the strength to carry a bulky, heavy piece. You’ll have to keep the dresser upright if the drawers are loaded. Plan ahead to determine how you’ll get the piece through doors and down stairs. A dresser is more difficult to carry when it’s loaded. Weight won’t slow down professional movers. We have the muscle and equipment to safely move large, heavy items. If you and your helpers can’t easily lift the dresser, make it lighter by unloading or removing the drawers. Even if your dresser is solidly built, you might need to unload it. You should remove and pack separately certain types of belongings. In general, soft things such as clothing, towels, sheets or pillows can remain in the drawers. Just be sure that the drawers aren’t overstuffed. Fragile items: Remove anything that could break if it shifts. Glass, art or porcelain should be removed. Wrap and pack these things separately. Jewelry: Jewelry can get lost or damaged during a move. Because it’s small, it can shift and get stuck in corners or slip through cracks. Secure and pack jewelry in a separate box. Money: Don’t move cash, checks, credit cards and the like in a dresser. You’ll want to keep money with you rather than loading it onto a moving van. Books, CDs, DVDs: These items are too heavy to stay in the drawers. They may shift during the move and damage your dresser. Valuable papers: Empty these from your dresser. Carry them with you rather than loading them in a van. Small, easily lost items: Anything that can shift, such as desk supplies, cosmetics or other small items should be packed securely in boxes. Desks: The small items typically stored in a desk tend to shift around. Securely pack papers, pens and supplies in a separate box. Filing cabinets: In many cases, you’ll need to pack files securely in boxes. If a filing cabinet is sturdy and can be locked, you may be able to leave the drawers as they are. Remove valuable documents and carry them with you. Beds with drawers: Empty drawers that are part of a bed’s frame. Beds are usually placed on end in the truck. Items left in the drawers will shift and could fall out. Tables, sideboards: These tend to have small drawers. Consult the above list to decide whether you should empty the drawers. Will the Dresser Stay Upright? Will your dresser need to be flipped to move through a door or carried up stairs? Some moves are trickier than others. As long as your dresser can be moved in an upright position, the drawers should be fine. If we need to take a dresser up a curving staircase or turn it on its side to fit through a doorway, then the drawers will need to be emptied. When possible, leaving clothing and other soft items in a dresser is a smart way to save time and use fewer boxes. We encourage any techniques that make moving easier! Every move is a balancing act. On the one hand, you want to streamline the process. On the other hand, you want your belongings to get to your new home undamaged. You can accomplish both goals by hiring a full-service professional mover such as Master Movers. We’ll handle the packing, loading and moving. Whether you’re moving to a new home near Portland, or setting down roots in another state, we can help make your move stress free. Contact Master Movers Moving & Storage for more information about our services. Call 503-762-1288 or click here to send us a message. Updated Sept. 16, 2016. Originally published Oct. 21, 2014.